The Internal Oscillator Mode uses two independent oscillators and a dedicated High Frequency Phase Locked Loop (HFPLL) to create three internal oscillator clocks. HFINTOSC - High Frequency Internal Oscillator (factory calibrated to run at 16 MHz). This oscillator is derived from the 500 kHz source and the HFPLL. MFINTOSC - Medium Frequency Internal Oscillator (factory calibrated to run at 500 kHz). LFINTOSC - Low Frequency Internal Oscillator (uncalibrated 31 kHz clock source). This is the same oscillator used for the Watchdog Timer, Power-up Timer and Fail-Safe Clock Monitor. 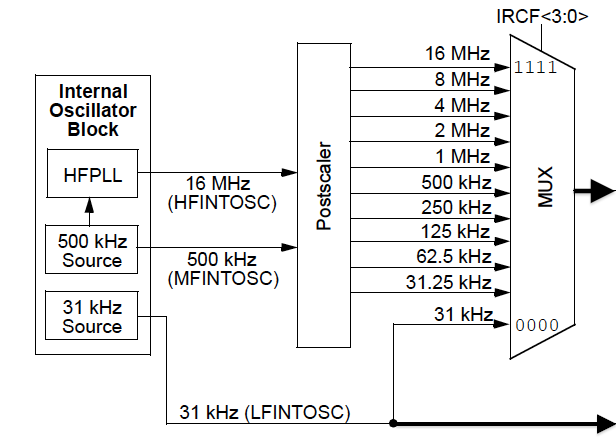 The HFINTOSC and MFINTOSC are routed through a multiplexer to produce a range of frequencies than can be selected with three bits in the OSCCON register. These are selected through the IRCF bits of the OSCCON register. The OSC1 and OSC2 pins are available as general purpose I/O when the internal oscillator is selected. The OSC2 pin can also be used to output the instruction clock with a configuration setting. To select the internal oscillator with the Fosc bits in a configuration register, the INTOSC is selected via the Fosc bits. Note: The SCS bits of the OSCCON register must also be set to "Clock Determined by FOSC" selection. To select the internal oscillator with just the SCS bits in the OSCCON register, the "Internal Oscillator Block" associated bits are selected. Note: On older devices the OSC2 clock out option is incorporated into the Fosc settings instead of a separate CLKOUTEN bit to set. 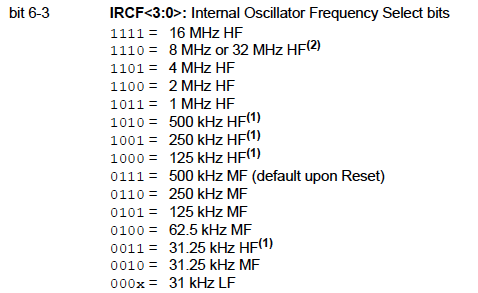 Once the internal oscillator is enabled the internal oscillator frequency select (IRCF) bits in the Oscillator Control Register (OSCCON) are set to select the oscillator frequency. The four bits select one of 15 different oscillator selections. The Internal Oscillator start-up is very quick and the internal oscillator will run the device at start-up if it is selected as the main oscillator, Two Speed Start-up is enabled or Fail-Safe Clock Monitor is enabled. The status of the internal oscillator can be monitored through the Oscillator Start-up Timer Status bit (OSTS) in the OSCSTAT register. It will be cleared when the internal oscillator is running. A 32 MHz oscillator will result in an 8 MHz instruction clock (Fosc/4) after the divide by four operation in the oscillator block. The OSCTUNE register can alter the frequency of the HFINTOSC and MFINTOSC through minor adjustments. The OSCTUNE contains a 6-bit value that can adjust the frequency within a range of +/-12 % of the selected frequency. The upper range of tuning in the OSCTUNE register are values; 01h - 1Fh. The lower range of tuning in the OSCTUNE register are the values; 20h - 3Fh. With the OSCTUNE set to 00h, the internal oscillator frequency will not be affected. For more detail on adjusting the internal oscillator with the OSCTUNE register refer to application note AN244.